Calla Gold Jewelry specializes in unique, custom jewelry designs for personlized pieces that you can't find at big chain jewelry stores. 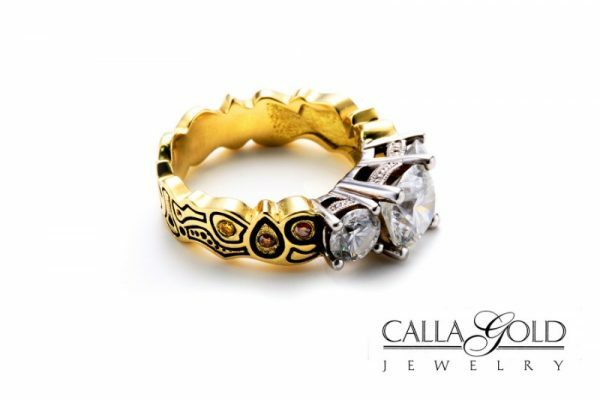 An experienced and distinctive jewelry designer, Santa Barbara jeweler Calla Gold personally helps you in creating custom jewelry based on your desires. The Jewelry you wear is an expression of your personality, passions, and lifestyle. While creating a custom designed piece may seem overwhelming, we are here to help simplify the process. I will work with you to develop a unique design that reflects your vision and is within your budget. My 30+ years of custom design experience can help bring your vision to life. Note: Most custom designed pieces take 4-8 weeks to complete. 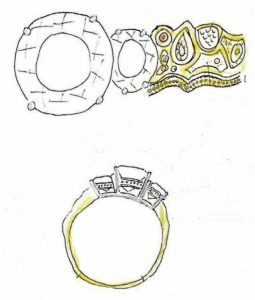 Designing your dream ring, (or other jewelry piece), involves exploring your taste. Whether you gravitate toward modern, vintage, rustic or somewhere in between, we explore and focus on what you love. We also look at your lifestyle. We build rings to work and be worn. It's fun as well to see what special details you like. 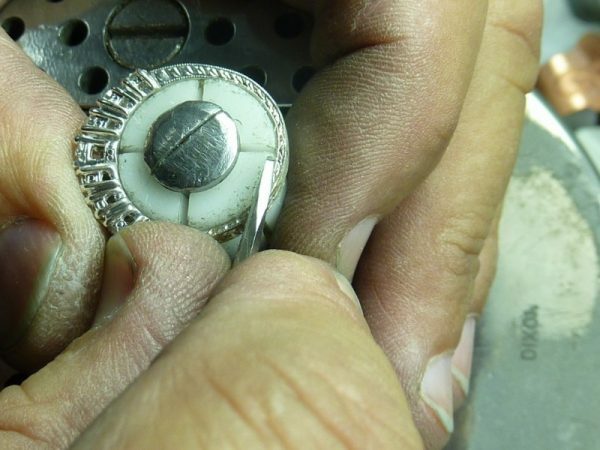 For example, hand engraving, hammer finishing, black rhodium plating, or matte finishing touches. It can be fun to explore examples with your jeweler. Discussion and drawings are the way to incorporate your personal style and details into a whole design. In this step we drill down to which setting styles will work best with your design vision and your lifestyle. We’ll figured out which width is best for your hand and what color of metal looks best as well. The CAD (Computer Aided Design) and wax show the shape, depth, height and curve of your ring. They are like the wireframe for your ring. 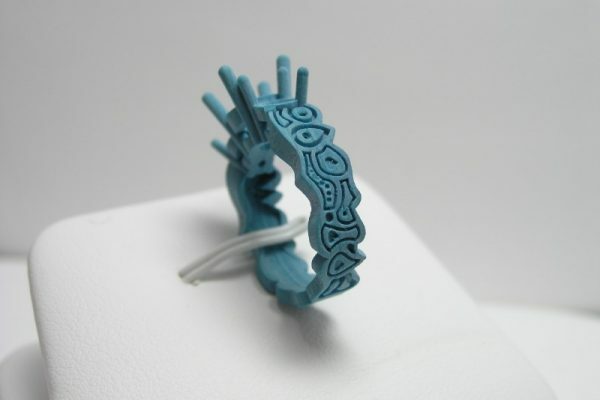 They can be funny looking and it’s important to know that they won’t convey the beauty of your finished ring. Details like special finishes and engraving won’t show up until after this phase. Once the dimensions for your project are figured out, the sizes of gemstones you need will be known. Generally, gemstones are selected at this point. If you already have your gems then the CAD will be created with them in mind. We select well matched, beautifully cut diamonds and colored gemstones for your project. We love offering many types of special finishes from hand engraving, rustic finishes, sand blasting, stippling, to pairing matte and shiny finishes. We also offer black rhodium finish and other effects. 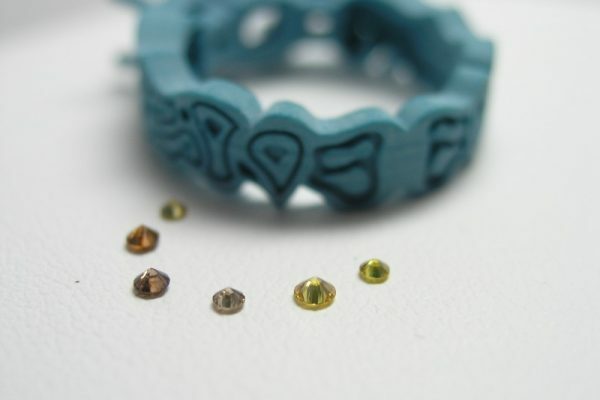 These finishes are put on once your ring has been cast and in many instances after your gemstones have been set. Step Six: Your Dream Ring Delivered! When you take your time to find details to incorporate into your design that you love and that your partner loves too, it’s more memorable and special. Working with a designer with deep skills and offerings of detail, helps you have a unique and beloved ring.